Our condo is located on the second floor with a perfect pool/ocean view, and only 200 steps to the beach. There are 2 bedrooms. The master bedroom has a king bed and a 3 piece ensuite. Air conditioning and a private balcony. The second bedroom has 2 single beds, or can be put into a king bed. Air conditioning and a balcony over looking the pool and ocean. 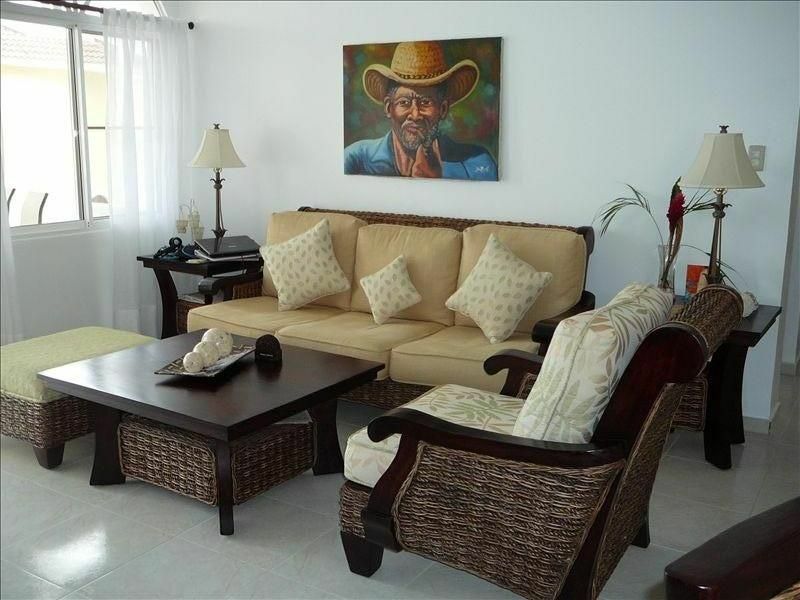 This condo comes with high end linens, designer furnishing and local artwork. Kitchen is fully equipped with stainless steel fridge, 6 burner stove, water cooler and all of your cooking needs. Full laundry facilities off the kitchen area is also available. Only 25 minutes from the Airport - transportation available upon request. Your food/drinks can be delivered the day your arrive. Ocean World / Casino a few minute walk. Johanne was an amazing host. From the maid who cleaned and cooked for us right down to the driver's. This stay was amazing. The condo view was the best view we had the whole trip. The sunrise was a work of wonder. Stay here and you will not be disappointed! It was a great place to spend our holiday. We sure enjoyed our stay at Johanne's condo.Everything was the way it was advertised. they are looking for a nice place to stay. We had a very wonderful experience. It was totally clean, Johanne was very helpful, the maid is so polite and we found everything we needed to enjoy our stay. We highly recommend it. Condo was exactly as pictured & had everything we needed! This was our first time renting a VRBO & we'll do it again! Johanne was great to work with & answered all of our questions quickly. The condo was very clean & our maid, Yulbi was so nice. She even made some special tea for my husband when he was sick! The area was safer than I thought it would be & we were able to walk to to the casino & different restaurants during our stay. We had an issue with the lock on front door not working & it was fixed immediately! Moreno was so sweet when picking us up from airport, bringing us to get groceries etc. We also enjoyed a couple meals at Chris & Mady's next door, very nice people! Other than a couple of us getting sick, it was a nice trip! Thanks so much for all your nice compliments. It seems to work out well for arranged airport pick up and to have at least 3-4 days worth of groceries when you arrive. Our maid sure tries hard to look after guests. I’m glad you had a wonderful holiday and look forward to you coming back. Everything was close by and the pool was beautiful and refreshing! I wouldn't know where to begin to describe how beautiful this apartment is. I know they say that photos don't do justice but in this case it is really true because the view from the living room and the bedroom balconies as well are absolutely gorgeous. Our house was kept spotless by the wonderful housekeeper who also cooked us a beautiful coconut fish dinner! The grounds are spectacular and the pool is crystal clear. The convenience of having restaurants and a store within walking distance is worth its weight in gold but there is always a driver willing and ready if someone wants to go into the city. I will be returning in March and I'm sure this will be considered my second home many times in the future! Many thanks to Johanne for hosting such an incredible and wonderful experience. Thanks so much for the Kind words Patti. Yes the view of the pool, ocean and grounds around the condo are beautiful. Our maid works very hard to keep our condo clean and to help our renters with awesome meals. I try and give as much information about our condo and area, along with tours to future renters when booking. I’m so glad you found it very relaxing and had an amazing holiday. We look forward to your return in the near future.